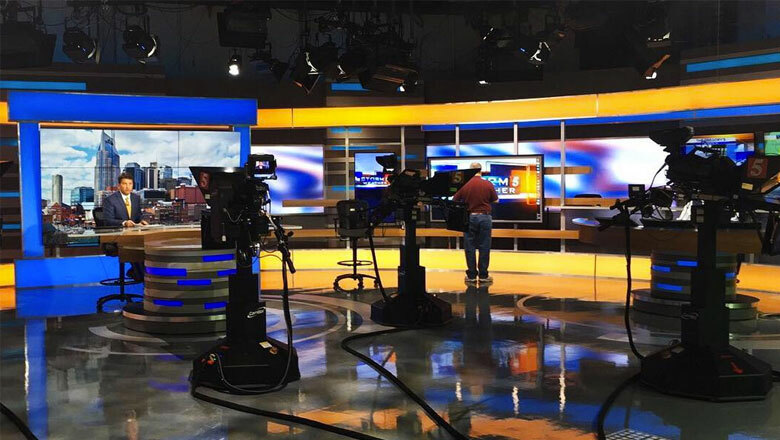 Nashville’s WTVF-TV has debuted a new home from Park Place Studio that combines multiple layers of technology and scenery to create a unique look through the use of layering. That layered look is perhaps most evident in the large multipurpose area featuring a base gray toned wall with horizontal banding and built in LED panels built into are used to create subtle color wash backgrounds. Mounted in front of the wall, meanwhile, are a mix of horizontal and vertical bands in varying thicknesses and finishes that, in turn, support vertically mounted video panels. 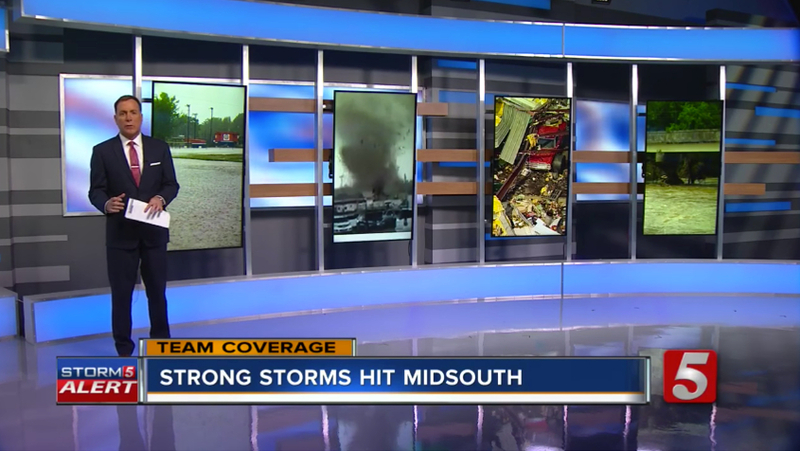 In addition to being used for branding graphics, the station is also using them to display relevant imagery to form a sort of “gallery” storytelling tool. These panels are used in tighter standup-style shots. 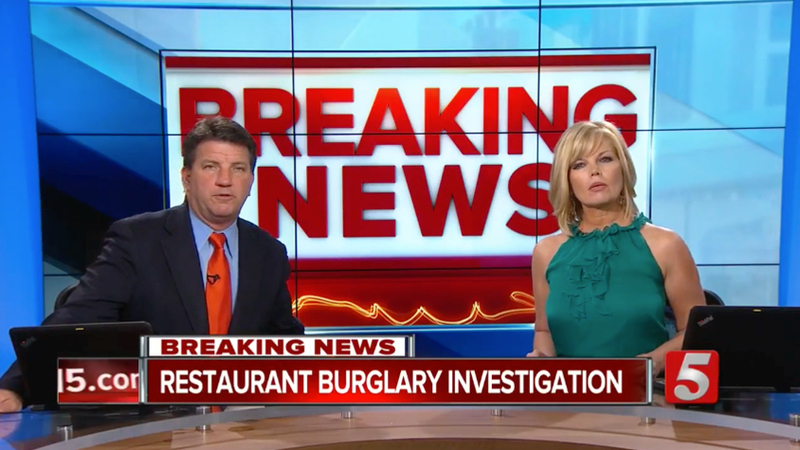 A more traditional 3×3 video wall is found behind the main anchor desk position and serves as a primary background there. Off to one side of the main anchor desk is a wall with the same layered look but featuring a single additional vertical monitor as well as a larger horizontal screen before transitioning to the weather center, which boasts multiple horizontally mounted panels behind the circular presentation pod. Both the anchor desk and weather pod are similar to those at former sister station KLAS-TV in Las Vegas that debuted earlier this year. 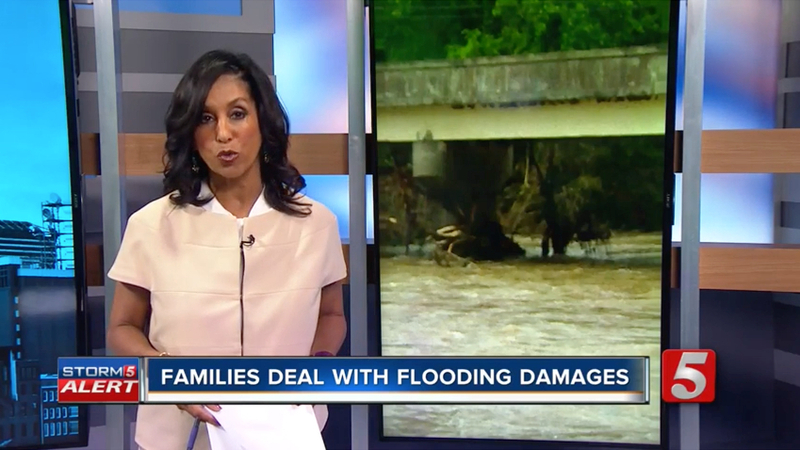 WTVF-TV is now owned by Scripps, while KLAS-TV is a Nexstar station. The set also includes a 5×3 wall serves as an additional presentation location as well as color changing base and header pieces throughout. In addition, lighting accents also add additional depth and texture to the set. The set is also a great example of how technology can enhance flexibility and effective storytelling in news set design. By stocking the set with multiple configurations of video panels along with color changing and LED panels, WTVF-TV has access to a wide variety of configurations for in-studio segments as well as the ability to add more options in the future.